An example of the type of street light used in the downtown business district at the turn of the century. The City Hall, a slate-roofed stone building was completed and dedicated in 1888. The front entrance seen in the photo was located on Lyon, but other entrances were on Ionia and Ottawa. 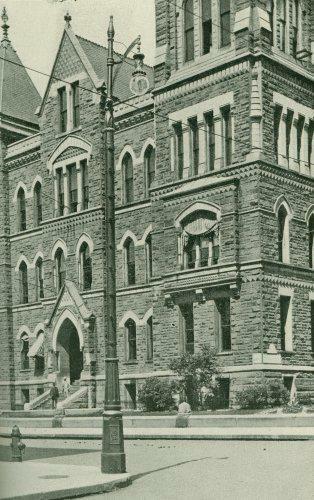 Construction began in May of 1885, the cornerstone was laid September 9, 1885, and dedication was Septmeber 26, 1888. Grand Rapids City Hall was razed in 1969 after an extended effort to save it. Photograph from the 1899-1900 Grand Rapids Annual Report of City Departments. For more street lighting images in the online archive look under the subject heading, Street Lighting.